This activity is related to a Teachable Moment from April 12, 2017. See "Celebrate Earth Day with NASA Science Data"
For this activity, 130 years of sea-level measurements have been divided into 20 data sets for examination. Depending on class size, the steps in “Procedures” can be done by individuals or groups of students. Students will examine all 20 data sets to learn how scientists study data over short and long periods of time. Some groups or individuals may need to examine multiple data sets in order to model all 20 sets. If you plan to have students transfer data into spreadsheet software, have them use the text files to do so. Otherwise, if students don’t have the skills to transfer the data into a spreadsheet, create graphs using the CSV (comma separated values) files. Depending on students’ familiarity with spreadsheets, the activity may need to be split into two days: one day for entering the data into spreadsheets and one day for analyzing the data. How do we know sea level is rising? Sea level is measured by monitoring stations on the shoreline and at sea. Satellites also collect data on the height of the sea level. There are more than 120 sea-level monitoring stations in the US and 240 additional stations worldwide. By looking at data from these stations over periods of 30 years or more, trends can be identified at individual stations and compared with other stations. This gives scientists useful information about local conditions. Those data can also be used to calculate the global average sea level and study it over time, giving scientists a picture of what’s happening to the ocean on a planet-wide scale. Sea level has been measured at some stations for more than a century, providing data about sea level going back to 1880. Melting ice sheets and glaciers on land add water to the sea. (See the “What’s Causing Sea-Level Rise: Land Ice Vs. Sea Ice” activity for more information about how melting ice contributes to sea level rise.) Of the total contributed by glaciers to rising sea levels, the Antarctic ice sheet may contribute about 10 percent, Greenland’s ice sheet adds about 30 percent1, and the lower latitude small glaciers and ice caps, which make up only about four percent of the total land-ice area, have added as much as 60 percent since the 1990s (Meier, et al., 2007). This data from NASA's GRACE satellites show that the land ice sheets in Greenland are losing mass. 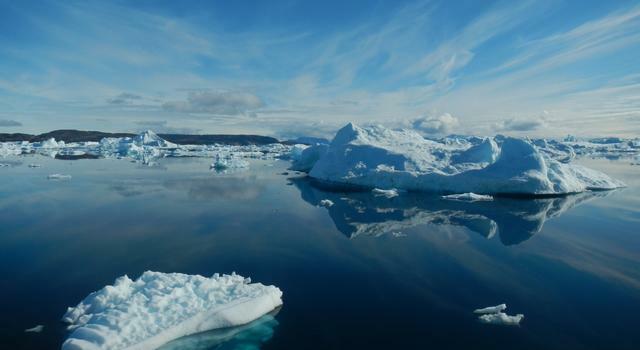 The Greenland ice sheet has been losing an estimated mass of 287 gigatonnes per year. Roll over the chart to see the various data points. 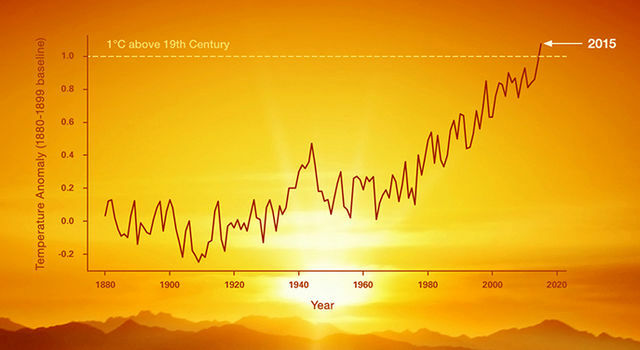 For more Earth vital signs, visit NASA's Global Climate Change website. The second, and less obvious, cause for rising sea level is thermal expansion. Water expands as it warms, so the more heat energy the ocean absorbs, the more space its water requires. It turns out the ocean can absorb a lot of heat, so as the atmospheric temperature rises, so does the ocean temperature. Atmospheric temperature is rising on land, near the ocean’s surface and in the lowest layer of the atmosphere as a result of increased levels of CO2. Since the beginning of the Industrial Revolution, the concentration of carbon dioxide in the atmosphere has increased by 39 percent. The majority of CO2 from human activity is created by burning fossil fuels that we use for heating, electricity and transportation. Much of this CO2 will stay in the atmosphere for thousands of years, trapping heat in the atmosphere as a result of the greenhouse effect. So global sea level is currently rising as a result of both ocean thermal expansion and glacier melt, with each accounting for about half of the observed sea-level rise, and each caused by recent increases in global mean temperature. From 1961 to 2003, sea level rose due to thermal expansion and glacier melt (small glaciers, ice caps, ice sheets) at a rate of 1.11 millimeters (0.04 inches) per year2. Between 1993 and 2003, the contribution to sea-level rise increased for both sources to 2.79 millimeters (0.11 inches) per year (IPCC AR4 WG1, 2007). 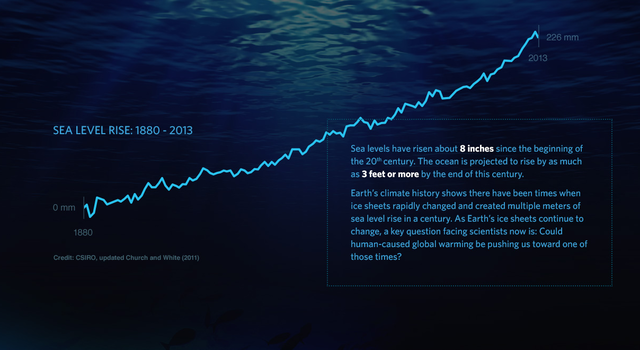 So, not only is sea level rising, but also it is rising at a faster rate than in the past. Currently, it is rising at a rate of over three millimeters per year. Ask students what sea level is and what tides are. Clear any misconceptions and make sure students understand that tides are an expected rise and fall of ocean water in an area on a daily basis, while sea level is an overall measurement of the average height of the ocean. Ask students if they think sea level is rising, falling or remaining steady. Ask students to explain their thought process. If students mention that sea level in a specific area is rising or falling, clarify by telling them that certain parts of the world, such as some areas in the Pacific Northwest of the United States, are experiencing drops in sea level, while other areas, such as the Gulf Coast, are experiencing rises in sea level. Tell them that what they are being asked about is the average global sea-level height. Tell students they are going to be looking at data sets that show measurements of the average global sea-level height over a period of approximately 130 years. Let them know they won’t be looking at all 130 years at once, but rather will be examining approximately 6.5 years per group or individual. They will make a determination about what they think is happening to the sea level for their time period. Then, all the data sets will be combined, and an assessment of sea level over a longer period of time will be made. Data is contained in two columns. The first column contains date information. The first four-digit number is the year. The following four decimal places represent a percentage of the year that has passed in days, falling approximately on the middle of each month. The second column is the Global Mean Sea Level (GMSL) in millimeters, compared with the average level in 1990. There are several options for importing text data into spreadsheet software. If students will be using the data already in a CSV file, skip to Step 6. Students can copy and paste data from the text file into the spreadsheet software. Depending on which software is used, the data may automatically be separated into columns. If it is not, use the Text to Columns (Microsoft Excel) or Split text to columns (Google Sheets) tool to separate the text into separate columns, divided by tabs. Alternatively, students can use the Import tool to locate the text file. Again, the software may automatically separate the data into columns, but if not, separate the text into columns using the tool(s) mentioned above. With the data in an open spreadsheet, there are two methods for graphing the data, depending on which software program students are using. Highlight all of the data in Column A and Column B.
Click the Insert menu and select Chart. In the Chart Editor window, click the Chart types tab. If not already selected, click Use row 1 as headers and Use column A as labels. Then select Line chart and click the Insert button. Click to select a blank cell outside of column A or B. From the Insert menu, click Chart and select Line (alternatively, select Line chart from within the Insert ribbon). In the blank chart area that appears, right click and select Choose Data. Click in the Chart data range box and select all of the data in Column B, including Cell B1. Click in the Horizontal (Category) axis labels box and select all of the data in Column A, including Cell A1 and click OK. Note: Selecting data and creating a line chart by default will not display the data correctly. If students want to select data and make a chart, they should select the data and choose scatter plot. Data will be displayed correctly and can then be turned into a line chart. Once a group has considered what the GMSL is doing, they will add a trendline to the chart to better display what the data is showing. Right click on the Line chart and select Advanced Edit. Within the Customization tab, find the Trendline option, select Linear, and click Update. Add a linear trendline. There are different ways to add trendlines, depending on which version of Excel is being used. Generally, clicking on the line chart and selecting the Chart Design or Chart Layout tab will provide options to add a trendline directly, or add chart elements, including trendlines. Students should then compare the trendline with their determination of whether GMSL was rising, falling or remaining steady. Record how many data sets showed GMSL rising, how many showed GMSL falling and how many showed GMSL remaining steady. By either having students combine all the data sets into a single spreadsheet, or by using the “monthly_GMSL_full.csv” file, repeat Steps 6 through 9 to create a line chart of GMSL from 1880 to 2011. Why is it important to look at sea level rise data over long periods of time? Short-term data might indicate GMSL is falling when it is in fact rising. What is causing the rise in GMSL that the data indicates? What is causing the melting of land ice and the thermal expansion of ocean water? A rise in land, air and sea temperature. What is causing the rise in land, air and sea temperature? An increase in CO2 in the atmosphere. CO2, a greenhouse gas, traps heat that would otherwise be able to escape into space, thus raising global temperatures. Human sources of increased CO2 include burning fossil fuels to generate electricity and power automobiles, planes, trains and other forms of transportation. Livestock (cattle, poultry, pigs, etc.) account for other sources of human-related greenhouse gases. We use energy to heat and cool our homes. The main source of that energy involves burning fossil fuels and releasing CO2. What can be done to reduce the energy used in heating and cooling? Moderate thermostats to cut off heat at lower temperatures and cut off cooling at higher temperatures. Insulate homes as much as possible. Plant shade-producing plants and trees. We use electricity to power appliances. What can be done to reduce the amount of energy used in homes, workplaces or schools? Think about what’s being left on and being turned off when not in use. Consider how phantom charges impact energy use. Connect appliances drawing a phantom charge to power strips and turn them off when not in use. We use cars for the majority of travel. What can be done to reduce the amount of CO2 released into the atmosphere when we travel and commute? We can take public transportation, carpool or use alternative transport such as bicycling and walking. Who else can make a difference? Students may consider contacting local, state and federal representatives. Complete the GMSL student record sheet. In addition to causing sea-level rise, the increase in global temperatures linked to higher CO2 concentrations leads to more heat waves and greater area affected by drought. We also see an increase in heavy precipitation events and flooding on land. Warm surface waters can damage coral reefs, reducing opportunities for fishing and tourism, and leave coasts vulnerable to storm surges and erosion. How can you make a difference? Calculate your carbon footprint to find out just how much carbon you’re contributing to the environment. Then, create a plan of action to reduce your impact. Climate Change Lessons and Activities from JPL Education – These standards-aligned lessons feature NASA missions and science and explore the changes happening on Earth, from sea-level rise to global warming. NASA Climate Change website – Explore news, mission data, images and vital signs that track the changes happening on Earth. Images of Change – Compare satellite images taken at different periods to see how Earth is changing. Climate Kids website – Games, projects, and activities all about Earth and climate for children between the ages of 8 and 13.